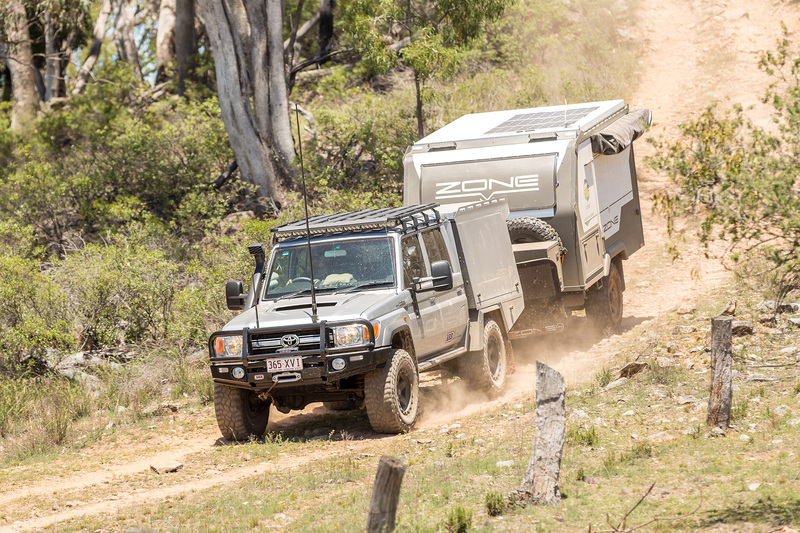 Zone RV burst onto the camper trailer scene in Mudgee, offering up the mighty Expedition. 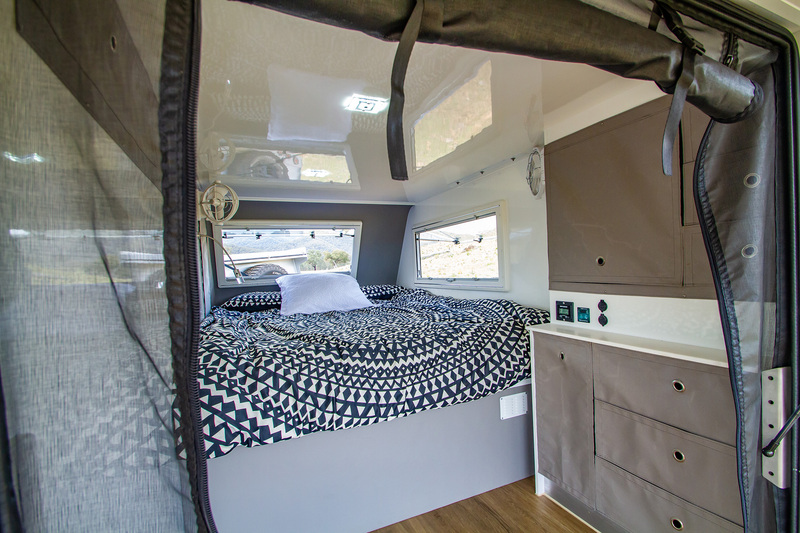 The judges observed how this camper channels the wisdom of various other industries, and, as a result, how it stands out with its low weight for size, exceptional build quality and spacious living quarters. They anticipate that, in the not-too-distant future, Zone’s Expedition Series will be a camper to be reckoned with. The Expedition was probably the toughest camper to judge at this year’s REDARC CTOTY. 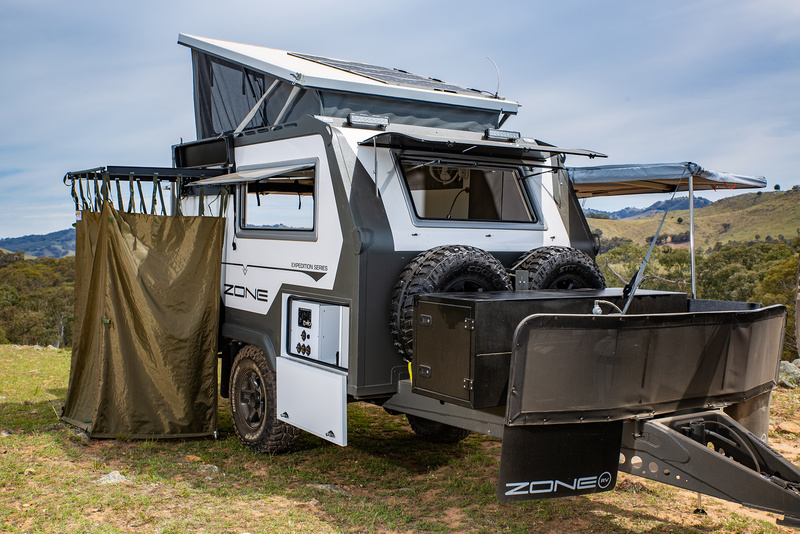 It was a late addition to the competition and a prototype, still in the development stages, so it wasn’t as refined as what we’d normally expect to see from the boys at Zone, who are best known for their high-end, luxury offroad caravans. This is, of course, reflected in the scoresheet. But don’t be fooled – the Expedition might be Zone’s first foray into the camper trailer market, but it shows a whole lot of potential. While there are a few refinements still to be made to the living quarters, there is no questioning the solid build and quality underpinnings. The floor, roof and side walls are made of one-piece fibreglass composite panels, held together with a marine and aviation industry-inspired bonding process. No screws, rivets or fasteners here! The 30mm thick fibreglass sandwich panels have foam core centres for insulation, and it was comfortable inside, even when copping the full brunt of the afternoon sun. There’s no timber and no frame, and at 1400kg Tare (as we saw it), the weight savings gained through the construction process are obvious. All the fabrication is done in-house and the specs are impressive. The 150x50x4mm drawbar is engineered to 4.5T and braced underneath, there’s a 150x50x3mm RHS laser cut DuraGal steel chassis with Raptor coating, and – while the base model will ride on independent coil springs – the camper on display at REDARC CTOTY had top-of-the-line Cruisemaster ATX airbag suspension, which made levelling the Expedition on top of the hill at Mudgee an absolute breeze. Plus, Zone is backing its product with a five-year structural warranty and a three-year warranty on other componentry. The Expedition has all the makings of a stylish, easy to use offroad camper and I, for one, am looking forward to seeing it in production. 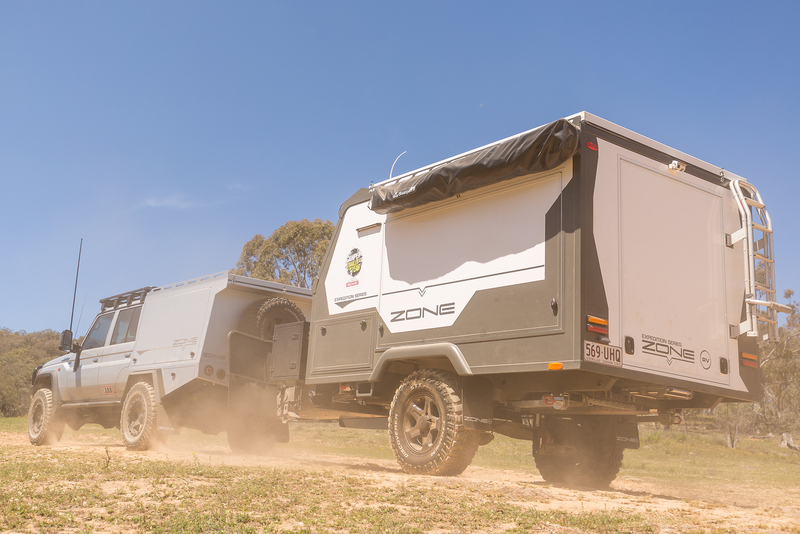 One of the best things about the Zone Expedition was that it represented a new face in the Australian camper trailer manufacturing scene, and one that came with quite a set of credentials. 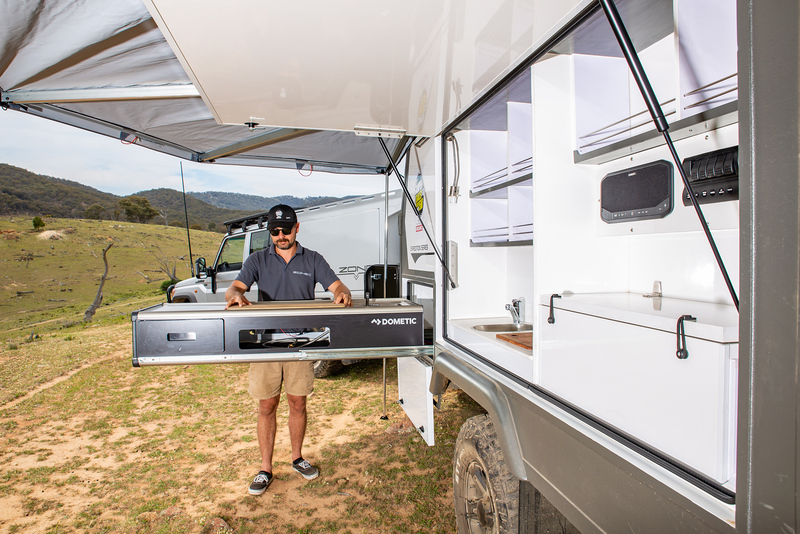 With a background in the luxury boating, aeronautical and cutting-edge composites fields, the Zone RV team has been assembling some breakthrough designs in the caravan world for four years, and has now turned its attention to camper trailers. The first camper off the line has been dubbed the Expedition, and, as a prototype, it had a string of design issues, but given a little time to iron these out it’s certain that this team will be making a big impact in the camper world. Under the internal bed sat a 200Ah Enerdrive B-Tec lithium battery, sustained by an Enerdrive 40A battery management system which handles input from mains, solar and the DC-DC input from the tow vehicle, without having 240V charge. If you need to run any appliances there’s a 2000W Enerdrive inverter. On the roof are three 110W solar panels, as we saw it. There are two 240V outlets internally, plus USB and cigarette points. Water is stored in two 100L tanks, expandable by an optional third 100L tank. Filling is by an optimal mains pressure plug – simply connect your hose and turn on the tap. All water passes through an AIC-K carbon water filter to remove chlorine, odours, rust, algae and sediment. There is a side shower fitting to work with the fold-out Quick Pitch shower ensuite. Gas storage, as we saw it, was a single 9kg bottle, but could as easily be the more adaptable two times 4.5kg layout. Starting at a base of $49,000 and rising towards $75,000 as we saw it, there was a lot to digest in the Zone Expedition. Twelve months of refinement will make a big difference to this camper. I look forward to what we’ll see next year. 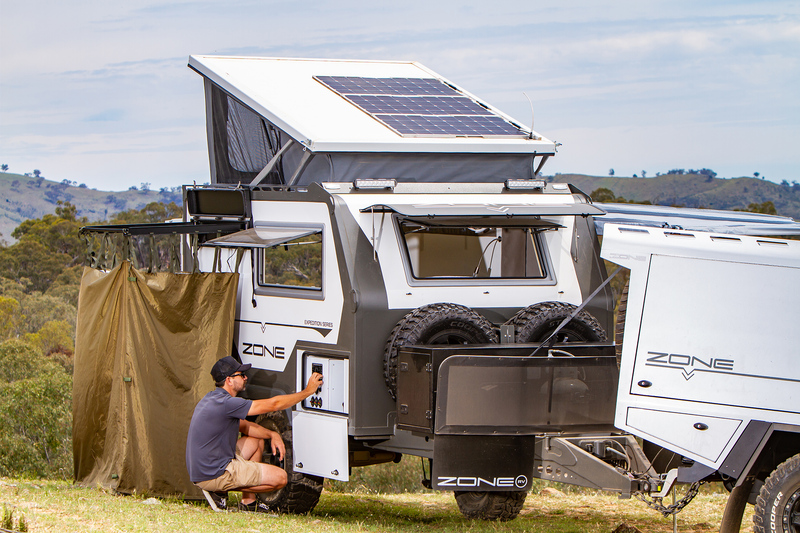 Zone RV, a premium Australian manufacturer, will do nothing by halves. This was undoubtedly reflected in the feature-laden, inventive and comfortable Expedition we saw at REDARC CTOTY, a prototype that paves the way for Zone’s strong future in this market. The Expedition has many elements of easy living excellence that will soften the campsite at the end of a hard day on challenging trails. Life really couldn’t be easier with the large opening passenger side and rear doors that pop open on well-weighted gas struts, providing not only immediate shade but revealing vast living spaces inside. You get immediate access to a huge pantry/kitchen area with tonnes of shelving and storage, plus an in-built marine style, low power composite fridge – eliminating the need for added slides and flexible wiring. Also immediately at hand is the head unit for the Fusion entertainment system, switches for all of the power and lighting options, plus handy 240 and 12 volt power outlets. Up in front is a large pull-out Dometic kitchen complete with hot/cold sink, two-burner stove and a tonne of utensils storage and flexible bench space. On the drawbar, there’s a full-width storage box with two handy sliding trays, each big enough for a generator, second fridge or similar. The main living space is strong, insulated and very cosy. The main ladder needs some refinement and in my mind so does the large rear access hatch; however, once inside there’s tonnes of room for travel toys, and a huge queen size bed with plenty of light and ventilation from two large double-insulated caravan-style windows, complete with black-out curtains and flyscreens. There’s even more cavernous storage under the bed, plus overhead and side lockers, a 12V fan, and an array of LED lighting including individual reading lights. Overhead is a huge pop-up roof top queen size bed, which may be handy for some, but to be honest my knees wouldn’t allow me to use the high, vertical access ladder. 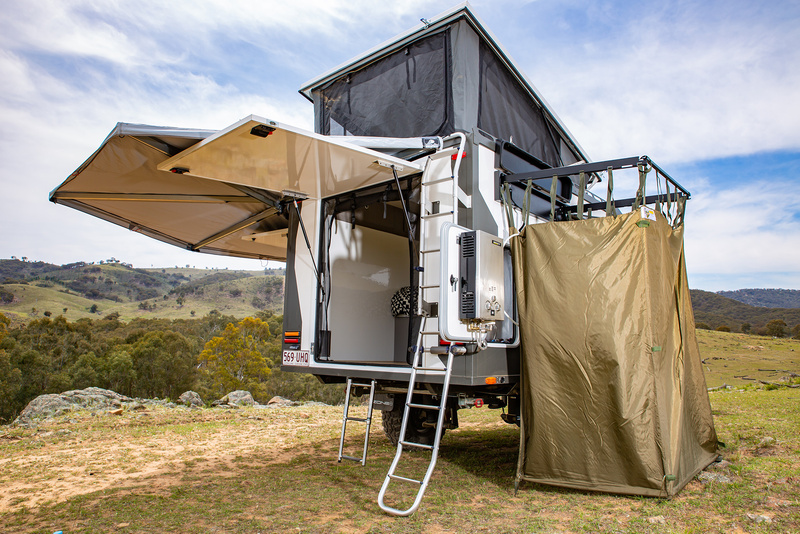 The entire living side and rear access is shaded by a ripper 270 degree bat-wing awning, extending the comfortable footprint and providing protection from the elements at a moment’s notice. 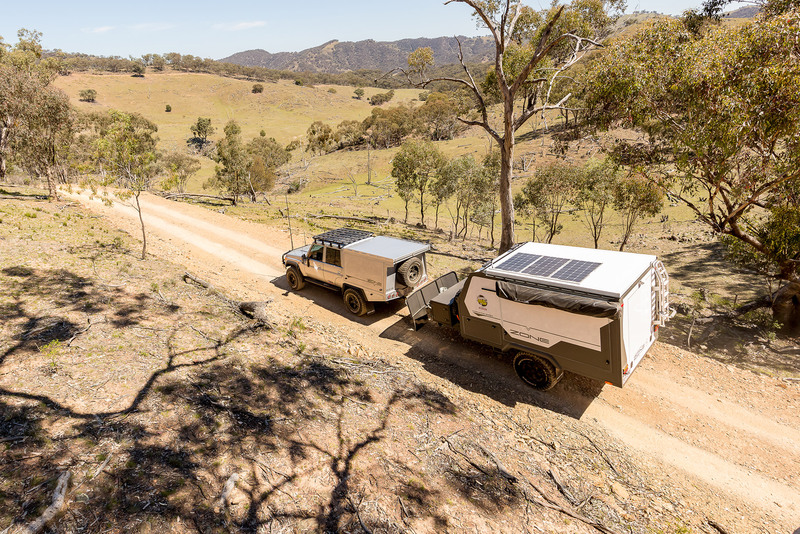 The Zone Expedition also provides plenty of life’s essentials of power and water, including a 200Ah lithium battery and 200 litres, plus a terrific side-mounted shower to help keep you fresh, clean and cool on the road. The Zone RV is a hybrid camper that is designed and built in Australia from the most modern materials using the latest construction techniques. That’s made even more stunning by a whole lot of well-thought-out innovation, much of it brought over from the luxury boat industry, where this company has had a lot of previous experience. This camper has more than its fair share of style, which is sure to impress right from the start. While it might be a largish camper, its modern materials and construction techniques make it surprisingly moderate in weight, with a Tare of 1400kg. 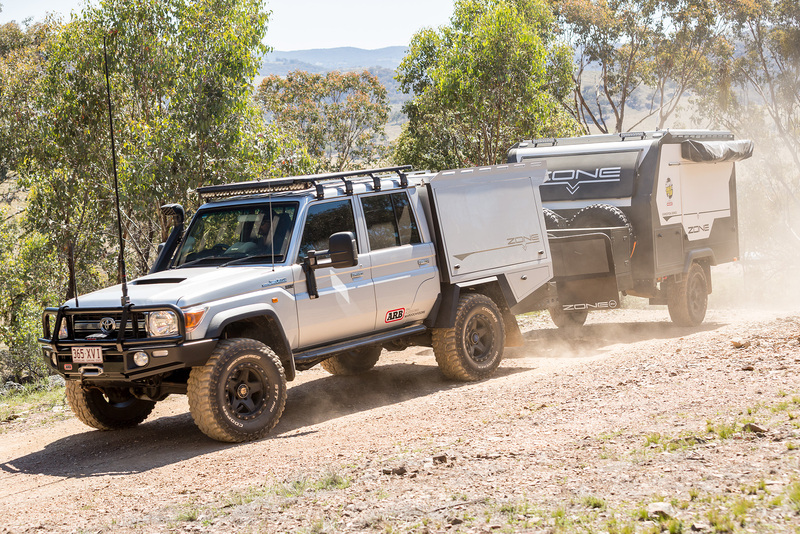 Its GVM is an outstanding 2800kg, meaning this camper has a payload of 1400kg – I doubt there is any other camper on the Australian market that can equal that. It also means you won’t be towing this rig with anything but a bigger 4WD. 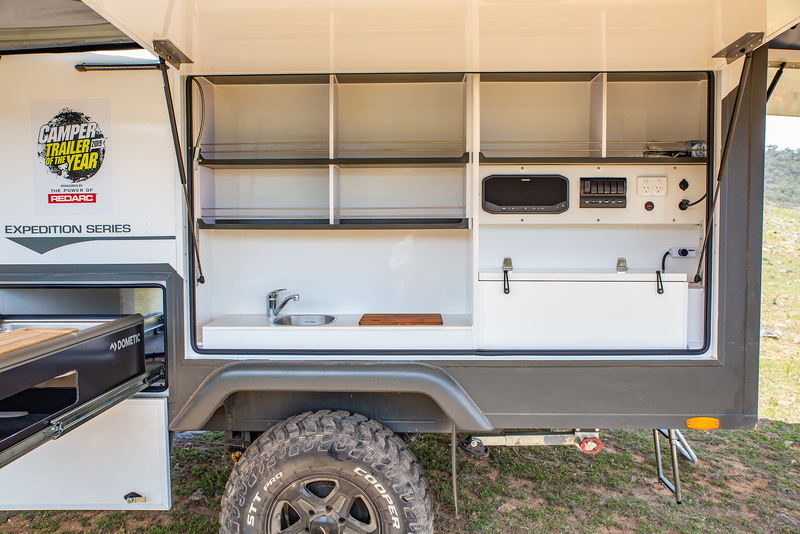 High quality components, fittings and accessories add to this camper’s awesome build quality. This camper is also extremely easy to use and very quick to open and deploy: slide the kitchen out, open the large side door and all the storage space you’d ever require in a pantry is available for immediate use; open the back door and you can immediately go to bed. Underneath is much the same, with one of the best suspensions I’ve seen under a camper, while the construction, welding and finish on every item was first class. Even the chassis and A-frame make a statement and, if anything, seem to be a bit of overkill for a camper. This camper exudes exceptional build quality and a quality of finish that is rarely found in camper trailers, usually being reserved for only the highest quality caravans. Whatever camper you are looking at, compare the quality and construction techniques against the Zone RV; there’s a small chance you’ll find something of equal standard, but you sure won’t find anything better! It features unparalleled levels of comfort and ease of use, but its tall stance may hinder it when it comes to narrow overgrown tracks – if that would be an issue to you.